My initial reactions to Windows 10 backup - Ask Leo! 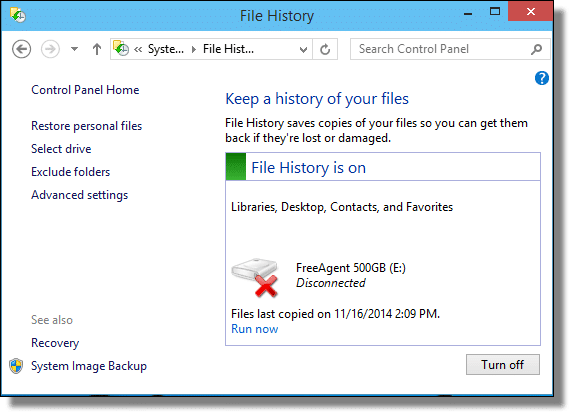 I took a look at the Windows 10 technical preview, and walked away very disappointed with Windows 10 backup. It's just as broken as Windows 8.1's, with no fix in sight. First, I have to start out with this: with very few exceptions, there is no reason to download and install Windows 10. Don’t do it. It’s called a “technical preview” for a reason: it’s not done. In fact, we may not see the finished product until well into late next year some time. That implies that not only will lots of things change between now and then, but that the features and functionality currently available in the technical preview should be considered “potentially unstable”. Put another way: as with any pre-release, “alpha”, “beta” or other unfinished software, it could crash, fail and erase all of your data when it does so. Just don’t do it. It’s not ready, and won’t be for quite some time. So what’s it for? It’s for people like me. People who want to check it out and see what it’s all about so that we can help provide feedback, or in my case, so that I can help you prepare. It won’t make folks looking for the return of Windows XP happy, but it absolutely avoids that horrid first impression when people were faced with the tiled start screen for the first time. In addition, many of the “apps” that ran only full-screen in Windows 8, like the Microsoft Store, can now be windowed. In many ways it’s a return to some basic Windows operations more familiar to desktop users. And that’s a good thing, in my opinion. Immediately after installing the preview, I made a bee-line to Windows 10 built in backup. And was seriously disappointed that it had not changed at all from Windows 8.1. File history: good. It’s a nifty feature and I’ll encourage folks to set it up. Image backup: hidden and crippled. I still can’t comprehend why something so important was crippled in Windows 8.1, and why that crippling persists. Once again there’s no way to schedule a regular image backup of your system. OK, technically I expect you can use the same command line + task scheduler hack that I outline in Saved! 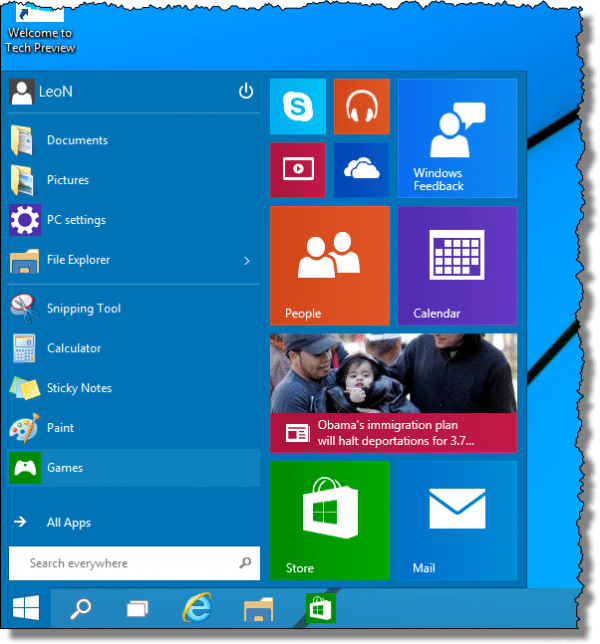 – Backing Up with Windows 8 Backup, but it shouldn’t be that hard! Backups should be easy. File backups in the form of file history can be, if you remember to set it up. The image backup function – a cornerstone of a comprehensive backup strategy in my opinion – is so well-hidden it might as well not exist. As I said, Windows 10’s release is not imminent, and you should not install or use it. It’ll be many months before Windows 10 is released – Microsoft has stated “mid 2015”, and some are already interpreting that to mean late 2015. In other words it could be close to a year from this writing before final release. That gives me hope. Hope that doing a better job with backups will make the priority list of things to be fixed before that release. Because as far as I’m concerned, it’s broken and backup is too important not to fix it. Until it is fixed, I’ll continue to recommend using a real backup program like Macrium Reflect to perform backups in Windows 8.1 and beyond. I did not, but I will now. 🙂 Problem is that since people interact so little with backup it’s unlikely that it would get enough attention to get the attention that it deserves. This is one of those higher-level decisions that needs to be made not because people clamor for it, but because it’s the right thing to do. I don’t get it, though. I just don’t get it. Now matter how you tell them, people never seem to learn. And Windows seems to have little interest in helping them do so. I think the idea is that if Windows included a good intuitive backup, more people would back up. MS failed on such a simple thing as usability in switching to the new Win 8 interface, usability in something not as obvious as backup is just wishful thinking. I hope this all changes for the better. When I teach new people our software at work, I always tell them to backup at the end of the day what they were working on that day. I tell them their team leaders won’t care if they stop working five or ten minutes early to do their backup, because if you lose it, you’ll be spending more than five minutes recreating it. The other day, sure enough, someone’s laptop crashed and burned. No hope of resurrecting. Problem is, IT does whole drive encryption, so they just couldn’t swap the hard drive into the new laptop. When we configured the new laptop for the software and went to retrieve his backups, they were 30 to 90 days old. Some stuff was there but more important recent stuff was not. Eventually, IT managed to get a key for the old hard drive that allowed them to plug it in to a USB cable and access the data on the old hard drive. So we were able to get his data back. This guy was lucky. Backups are too important to be mickey mouse. Support generally means supplying a contact website, email address or phone number where you can communicate with a support technician. Leo I thought you’d suggested avoiding the Windows built-in backup even before Windows 8. Didn’t think of going back there again. I’m currently using Macrium Reflect on Windows 7 and I assume this is still your first choice. Would continue with the same program even if I upgraded my computer. I am a true believer in backing up everything and doing an image of my drive, it has saved me many times as I am always trying out new things and have had to restore more than once from an image. I know many who have no idea how much time it would save them just from doing a simple backup and image of the machine. I still claim it’s a great backup program. Filling up an external hard drive can happen if you don’t use or configure it properly. I have been using Acronis 2015 for over a year now to do my system image backups. I also use File History for my music and document files. As far as Windows 10 goes, I have the latest build installed on Virtualbox. I am pretty confident that Acronis will work once 10 is released. SEE: https://forum.acronis.com/forum/67586 [You can follow this link and view without signing in]. This is the place on ACRONIS User Forum whereI saw some initial testing of Acronis True Image was done by users, not Acronis staff. If you notice, they indicate that in doing image backup with TI 2014 it did not work as well as TI2015 while the built in Win10 image backup did. At the same time, TI2015 did better than TI2014. In any case, from the dates of the forum posting, this was on an older build. also note that Acronis Disk Director 12 did not appear to recognize the partitioning scheme either. As several have mentioned, until WIN 10 is at least officially released, I wouldn’t trust anything yet. Will my programs still be there(like office) if I upgrade to windows 10? If you upgrade, then they should be. There are some great third party backup programs. Leo highly recommends Macrium Reflect and has written several articles and a book on it. Other good free alternatives are Aomei BackerUpper and EaseUS Todo backup. I got down to about reply five and left due to the third pop-up all relating to your page Leo….really? It’s a bit to much, I know I’m here, have been many times, but will no longer due to the unnecessary popups. Hope this will persuade to set the popups off to the side, if you really need them before more bail. I always picture visiting a forum like being in a meeting and the pop ups are people walking in asking if we need our pencils sharpened, or if anyone needs to go to the bathroom. It’s such an ridiculous and unrelated interruption to the sole purpose of the meeting, it really makes you say WTF. Finally, as far as the “Don’t Do It”. I say Do It. If the person “doing it” doesn’t realize two major factors (Windows 10 (future) release date and the term Technical Preview) then well, shame on them for not reading….anything. It is necessary to use a third party backup software. I have used paragon, acronis, Aomei backupper, EaseUs todo backup. First two are paid version and the last two are freeware. Aomei backupper is the one impressed me most among the four i have used. I use Acronis True Image for backup. Dont think I ever need builtin backup.